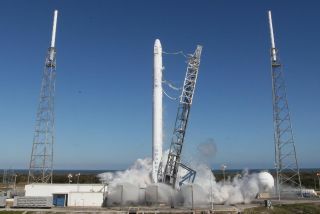 SpaceX's Falcon 9 rocket carrying the company's unmanned Dragon vehicle loaded down with supplies is expected to launch from Cape Canaveral Air Force Station in Florida on April 14. This will be SpaceX's third official flight to the station under a $1.6 billion contract with NASA to fly 12 missions to the orbiting outpost using the Dragon capsule and Falcon 9 rocket. You can watch the SpaceX launch live on Space.com via NASA TV starting at 3:45 p.m. EDT (1945 GMT) on April 14. Launch is scheduled for 4:58 EDT (2058 GMT). "These new legs, funded by NASA's Human Exploration and Operations and Space Technology mission directorates, will provide R2 [Robonaut 2] the mobility it needs to help with regular and repetitive tasks inside and outside the space station," NASA officials said in a statement on March 12. "The goal is to free up the crew for more critical work, including scientific research." If launch occurs on time, Dragon is due to arrive at the station at around 7 a.m. EDT (1100 GMT) on April 16. If the SpaceX launch does not occur on time, there will be another opportunity for launch on April 18.